This part (Physiological Disorders) includes the most common disorders of physiological origins found in the apple orchards during the period of flowering/ fruit setting till the harvesting stage of the crop which affect the quality of apple. Most of the crop doesn’t qualify the packing norms while grading, sorting and packing apples, due to which apple growers have to bear heavy loss. 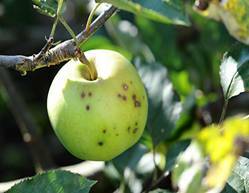 Apple scab is a airborne disease caused by the fungus (Venturia inaequalis), that spreads by airborne spores and survives the winter on fallen leaves. 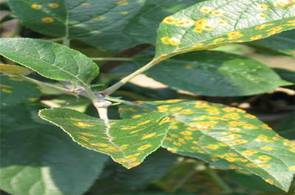 Scab marks to appear on leaves from February until leaf fall Mid-November. This is a disease specific to apples and other trees. A closely related fungus, Venturia pirina, causes a similar disease mostly on apple and pears. 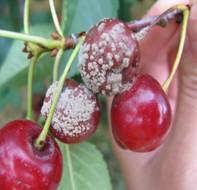 It is fungal disease affecting mostly all types of apple, pears & cherries trees grown in Himachal Pradesh. The damage that it is able to do can be quite severe if it is not treated on time, it can spread as fire. It not only affects the tree but also affect the leaves, fruits and finally tree. When affecting apple tree, it can cause deformations, cracks and soon the tree dries also in some cases dries and kills the tree. 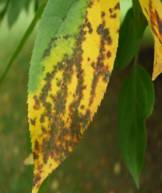 Leaves on leaves: Patches of olive-green marks or blotches appear which are initially velvety as they release airborne spores, and then darken up. Affected leaves often fall prematurely causing the damage to the health of tree. Scab on young shoots: Infections cause blistering and cracking which spreads with time if not treated and further worsen the situation when it provide entry for the apple canker pathogen, results it kills the shoot and finally the tree. Scab on fruit: Black scabby blotches develop and, as the fruit matures, these restrict expansion of the skin, leading to distortion and cracking. Light attacks only damage the skin and eating quality is hardly affected (the disease is commercially very serious; growers cannot sell scabby fruit in market). However, if the fruits crack as a result of scab they become prone to fruit rots and result the shelf value decreases. Non-Chemical Measures : Pruning out infected stems or shoots and burning or composting fallen leaves and infected fruit will reduce the amount of fungus available to start infections in the next season, this has to be carefully done as it is airborne disease. Is a fungal disease of the foliage, stems and occasionally flowers and fruit where a superficial fungal growth covers the surface of the leaves of plant. Plants are affected including apple (the powdery mildew fungi are major pathogens of cereal crops) the decease can reduce the heartiness and yield of apple trees. Certain varieties are more prone to this, including the Baldwin, Cortland, Crispin, Gala, Golden, and Delicious Red etc. However, most of apple tree can develop this. Infected parts of the trees will look like they have a grayish/ white powdery growth on them white powdery spreading patches of fungus on upper or lower leaf surfaces, flowers and fruit. Sometimes tissues become stunted or distorted, such as leaves affected by rose powdery mildew, in many cases; they appear to be “web like”. It can appear on the trunk, branches, leaves or apples. Infected tissues show little reaction to infection in the early stages, but in specific cases, for example on Rhamnus, the infection provokes a strong colour change in the infected parts, which turn dark brown. The fungal growth is light and difficult to see despite discoloration of the plant tissues, the leaves can actually begin with a yellow color on them and they often crinkle up e.g. on the undersurface of rhododendron leaves. Burying fallen infected leaves and pruned shoots in the month of November will reduce the amount of infectious spores next spring. Mulching and watering reduces, water stress and helps make plants less prone to infection. Pruning out the infected shoots will reduce the disease. Most powdery mildew fungi have a host range restricted to a relatively few, related plants, but these can include wild relatives which can be sources of infection, e.g. 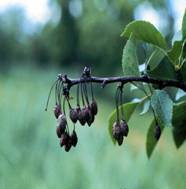 wild crab apples may be sources of infection for apple orchards. 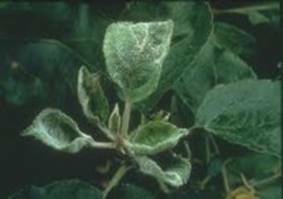 The growth of powdery mildews is found on the plant surface they are easily targeted with fungicides and can be used on apples and pears. 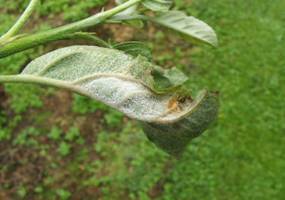 There are 2 steps in treating this apple tree disease. To reduce the number of spores that grows on new green foliage. To stop a 2nd infection on any shoots, buds and leaves that will sprout during the growing season. Spraying is done when the petals start to naturally fall. It is done every 15 days, in a month for best result. This will continue until all of the petals have fallen. It is recommended to also use cover sprays that will be applied until buds have set and are not able to be susceptible to the infection. This is an interesting apple tree disease in which apple tree must be present within relative distance in order for this to happen. At first notice it can be seen, that there are shiny orange spots on the leaves. They are also a bright orange color or a rust color and are slightly raised when on fruit. It will turn to a brown hue and have a cracked appearance. If this disease happens in shoot, stem will look like swelled and no fruit will grow on it. In winter’s time fungus grow on cedar trees then, when things thaw out during the February; the spores are carried by wind and water over to apple trees. 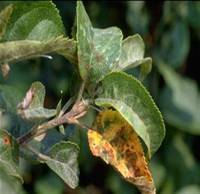 If the temperature remains between (12 to 24C) and it stays wet from rain or moisture for 4-6 hours, this apple tree disease will take root, spots will begin to appear about 10 to 14 days later. And, in the late summer, any spores that are on the lower part of the leaves will be carried to infect any cedar trees that are nearby. Only fungicides can treat this type of disease and is very effective. This is an element of spraying your apple trees. It should be applied when the buds are pink. If you are able, it is recommended to remove any cedar trees that are within a 3.3 km radius of your apple trees do it If you have a large orchard and your orchards is in good climatic conditions because cedar tree has advantage. Is bacterial disease which kills the shoots of apples, pears and their ornamental relatives, giving the plant the appearance as, burned in forest fire. Newer shoots are more susceptible than older, established one and when the buds open in the spring, the bacteria grow very rapidly and begin to infect and spread. Spreading of this is due to many means including water, insects and even pruning tools. Fire blight, bacteria thrives when the air has humidity to it and it is between (22-27° Celsius). Blossoms wilt and die at flowering time; slimy white liquid may exude from infections in wet weather. Prune out and burn infections promptly, peeling back the bark to reveal the brown staining and cutting back (1ft) to healthy wood in smaller branches, (2ft) in larger ones. Wipe pruning tools with disinfectant (Jeyes Fluid or methylated spirit) between cuts to avoid spreading the bacteria. Remove secondary, late blossoms before they open pruning tools should be cleaned after each use to avoid the spread of this onto other apple trees. 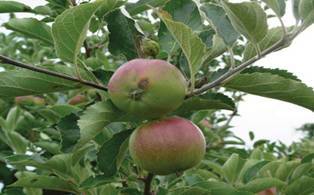 No as such specific chemical Measures for fire blight, but applications of copper fungicide for Measures of apple canker may give some incidental measures. For those with medium to large orchards, antibiotics and copper mixes can be used to Measures this, in the form of sprays it has to be applied 2-3 times depends on the disease. 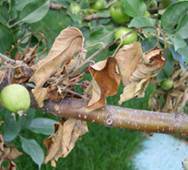 Brown rot is a fungal disease of apples, pears, plums, cherries and other fruit trees, causing a brown, spreading rot in fruit. It is caused by the same fungi that cause blossom wilt of the flowers and fruit spurs. Brown rot is a fungal disease of top fruit, caused by the fungi Monilinia laxa and M. fructigena. The two fungi are very closely related and indistinguishable to the naked eye. M. laxa more commonly causes blossom wilt on pears and stone fruit, and a specific form, M. laxa f. sp. mali is restricted to apples. M. fructigena can cause brown rot in most fruit trees. Affected fruits stop, growing and starts decaying and may remain hanging on the tree and where they touch the bark they cause small infections (cankers). The fungus remains in the dead fruit and cankers over winter and releases spores in the spring to cause the blossom wilt phase of the disease. Rotting fruit are found from mid-summer onwards. 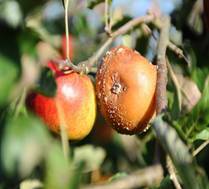 Brown rot in the fruit, spreading out from wounds, especially those made by birds, codling moth and apple scab infection affected fruits remain hanging. Buff-coloured pustules of the causal fungi on the fruit surface, often in concentric rings. Can usually be seen under wet conditions. 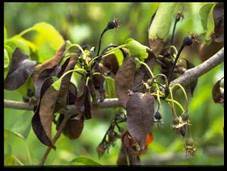 At flowering time the same fungi cause blossom wilt, where blossoms and leaves on fruiting spurs turn brown and shrivel. Severity varies greatly from year to year, depending on weather conditions at flowering. Do not allow rotted fruit to remain on the tree. Removing all brown rotted fruit promptly and composting. Pruning out and burn infected spurs and blossoms to reduce infection. 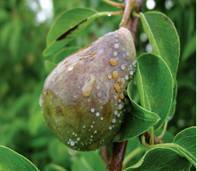 The fungicide is used to Measures brown rot on cherries, plums, prunes, apples. Spraying susceptible trees at the beginning, peak and end of flowering may reduce the severity of the disease and stops in spreading it. Fungicides applied for other purposes, such as scab Measures, may give some incidental Measures though this is not claimed by the manufacturers.